What is a first look? A "first look" is when a couple sees each other on their wedding day before their wedding ceremony. It is a private moment for the couple, away from the eyes of family and friends. It's a lovely newer wedding day tradition, but it's not for everyone! 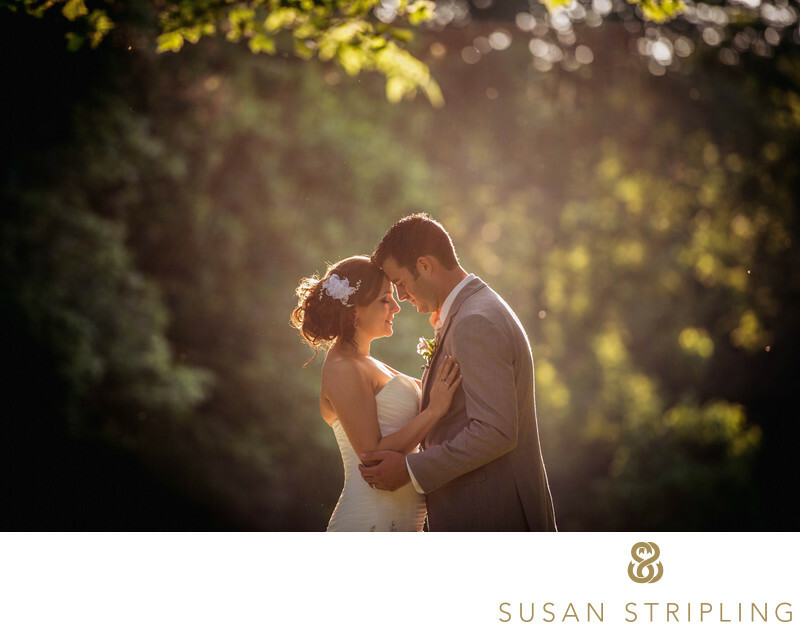 Many couples do not want to do a first look, for a variety of excellent reasons. Some couples wish to do a first look, also for a variety of excellent reasons! If you want to do a first look, you need to understand the pros and cons of doing so. After you weigh those pros and cons, you make the decision that is best for you. Not for anyone else. If you don't want to see each other until you walk down the aisle, that is a decision for you two to decide on together! Don't let anyone pressure you into deciding for or against what you know in your heart to best the best decision for your wedding day. Whatever you choose to do will be okay with me! It's not my day, it's yours! Let's look through the pros and cons of your decision! You'll get to see each other before the ceremony. Any stress, fears, jitters, or nerves will be gone by the time the ceremony starts. You'll be calmer and more present during your ceremony. 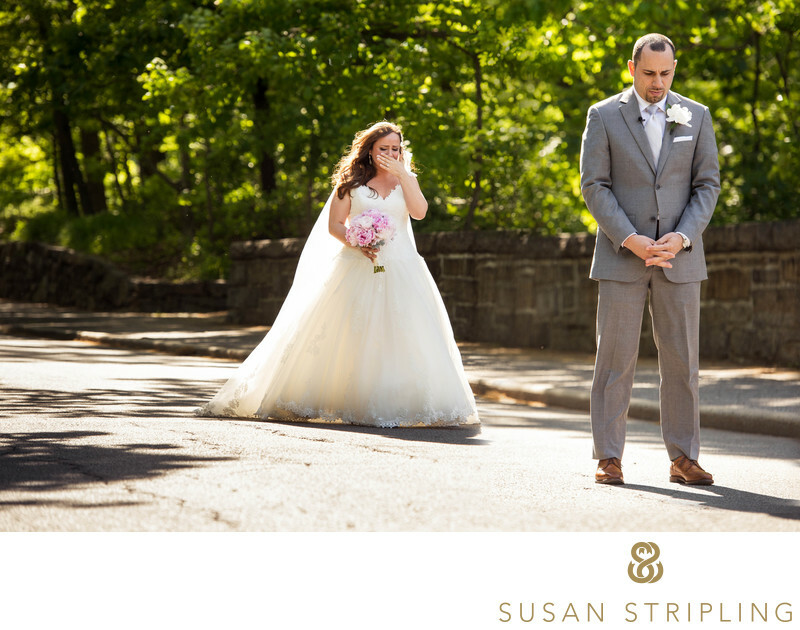 Many clients even mention that the moment they see each other in the aisle is just as powerful as when they see each other for the first time before the actual ceremony. 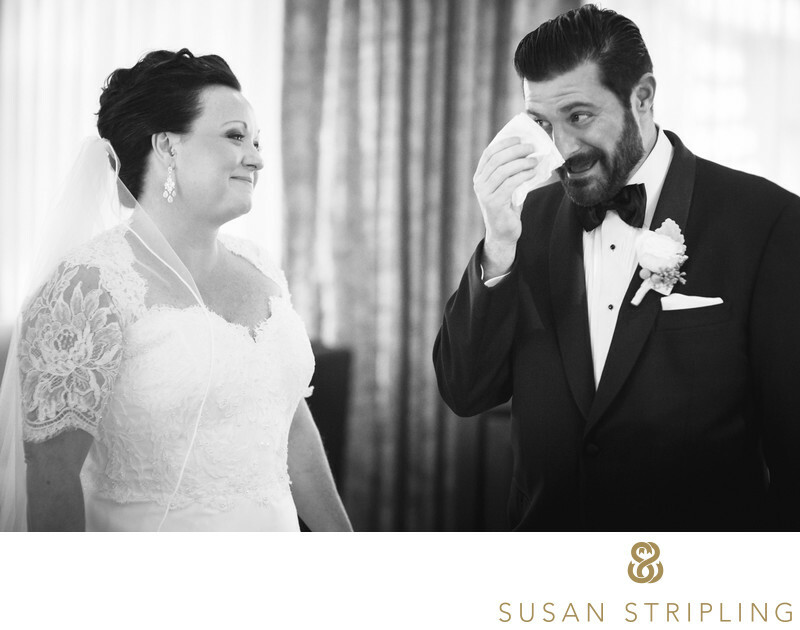 If you're going to cry when you see each other for the first time, you'll be able to freshen up before the ceremony! You won't miss cocktail hour if we take your portraits and your family formal portraits before the ceremony. Privacy. Enough said! You won't have anyone's eyes on you, no guests will be taking pictures with their iPhones, no bridal party will be cheering or clapping. It will be a moment that is yours, and yours alone. You'll have more time together to emote. If you wait until your ceremony, you have to get right into the ceremony itself. If you do a first look on the wedding day, you'll be able to hold each other and be in the moment as long as you'd like. You will probably have more time for portraits of the two of you together. We can spend twenty minutes, an hour, two hours, or more together taking portraits at multiple locations, if you desire. If you wait until cocktail hour to take your portraits, we've got forty-five minutes to seventy minutes (depending on the length of your cocktail hour) to get all of your family formals done, as well as all photographs of you two together. You can choose the location for your first look. If you want to do it outside, on a pretty staircase, or in another cool location, you can. We can control the setting and the lighting. That's not usually an option during the ceremony. If you're having a winter wedding, and it's going to get dark early, you can have your portraits taken during daylight. Why might a first look not be the choice for you? If anything runs late before the first look, we'll lose out on time. We'll have less time for portraits, and everything will be pushed back or end up being cut out of the day. Hair and makeup might run late, flowers might be late to arrive. Even if you're the most prompt person ever (and I love you if you are! ), wedding days have a lot of moving parts, and not all of those parts arrive or end on time! If you do a first look on the wedding day, you'll have to get up earlier, get ready earlier, and be in your wedding clothes longer. Your parents, bridal party, and guests won't be a part of when you see your spouse for the first time. That can be a very emotional, meaningful moment for them, especially the parents. If you're not sure how they feel, just ask them. Will they be upset if they don't see you seeing each other when you walk down the aisle? Will that factor into your decision? Your dress might get a wee bit dirty. If we go to a park, gardens, or let's be honest, anywhere outdoors, it will be 100% impossible to keep your dress pristine. I promise you that we are as incredibly careful as we can to keep you clean, but unless you're on a polished floor or clean carpet all the time, you run the risk of picking up dust, dirt, or the occasional stray twig and leaf! If that bothers you, a first look on the wedding day might not be a good choice for you. Unless you hire hair and makeup to stay longer, you'll have to touch yourself up between the portraits and the ceremony. If you do your portraits before the ceremony, you won't actually be married in your portraits. That bothers some people, doesn't bother others, but should be considered. Will it be less meaningful to look at those portraits later, knowing you weren't actually married yet or wearing your wedding bands? If the tradition of waiting to see each other at your ceremony is important you, stick to that feeling. A good photographer will find a way to make beautiful portraits for you in a limited time post-ceremony. Do you feel weird about the idea? Are you worried about how you'll react? Or how your future spouse will react? Does it make you nervous at all? Some people are really freaked out about the idea of emoting on cue, or being expected to react in a certain way. Did YOU do a first look when you got married? My husband and I didn't do a first look on our wedding day. I didn't care that it was a winter wedding and we didn't have any daylight for portraits. I didn't care that we were going to miss cocktail hour. I didn't care that we have precisely four portraits of us together because of time constraints during cocktail hour. I didn't care about any of that, because the moment that I saw my husband when I came down the aisle was one of the defining moments of my life. I know us well enough to know that a first look would not have provided that moment for me. Or for him. Or for us. So we didn't do it. And I have no regrets. But let's be clear here - how I feel doesn't matter. Not personally. Not professionally. And it shouldn't matter to you, because I will shoot your wedding day with grace, respect, and great joy no matter if you see each other before the ceremony or not. I will support you decisions, celebrate with you, and endeavor to make amazing images for you whether I have three hours with you or two minutes! A photographer on Facebook once asked me, "How do you convince your clients that they NEED to do a first look to get good pictures?" My answer is that I don't and they totally don't. I can get "good pictures" in two hours, and I can also get "good pictures" in thirty seconds. The wedding day is not a photo shoot. It's a wedding, a joining of a couple into a new family, a sacred event. It's not my day. It's your day. The decision to do a first look isn't, and shouldn't be, mine. If you're on the fence about a first look, please give me a call! I'd love to talk to you about the timing of your day and your feelings, and help you determine if it's a good idea for you or not. I promise to give you my honest opinions about your timeline, but ultimately the choice is up to you. I will support you in your choice, and help you work your timeline to the best it can possibly be. Whether you see each other going down the aisle or sometime before, I will be there for you.